After clicking Continue a couple of times, up came the login screen. I logged in, and I was literally right where I left off before the repair man came round. All apps still installed just as I left them; all the files I checked present and correct; all my app settings exactly as before. Even Missing Sync appears to work. In fact the only annoyance was that it didn’t copy across my /etc/hosts file (which contains around 100 custom host entries), but this was easy enough to get off the backup drive. Maybe that’s what that red error message earlier was referring to. So with minimal intervention on my part, the Mac is back up and chugging along nicely with its new drive. I must say, I’m impressed. I was questioning the reliability of Time Machine last month, but I have to say that today my faith in Time Machine has been fully restored. Fully restored. Geddit? 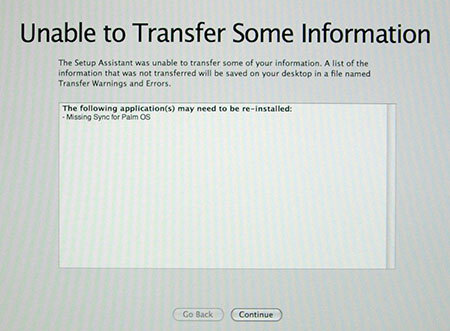 This entry was posted on Tuesday, August 5th, 2008 at 9:28 pm	and is filed under Hardware, Mac OS. You can follow any responses to this entry through the RSS 2.0 feed. Both comments and pings are currently closed. 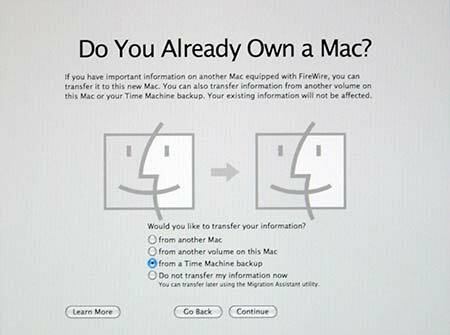 @Carlo: No, I think it will only restore from the most recent Time Machine backup. Apple’s iMacs seem to have very cheap hard drives and they basically fail after a year-or-so. This is a HUGE problem which Apple refuses to publicly acknowledge. You made the right decision to buy a three (3) year warranty but it looks as if Apple isn’t just lowering its prices, it’s also cheapening its machines’ components. Or maybe it’s just that particular batch of Seagate (I think) hard drives which were unusually cheap. Whichever, consumers who don’t have a warranty will need to pay up to have things fixed. @Claude: Thanks for your comment. In fact both my original iMac drive and the replacement drive were WD Caviars. I wish they *were* Seagates as I’ve personally found Seagate to be much more reliable than WD these days.